Another month another set of must haves. Every months I have a few things that I use on repeat and just can't live without that month. 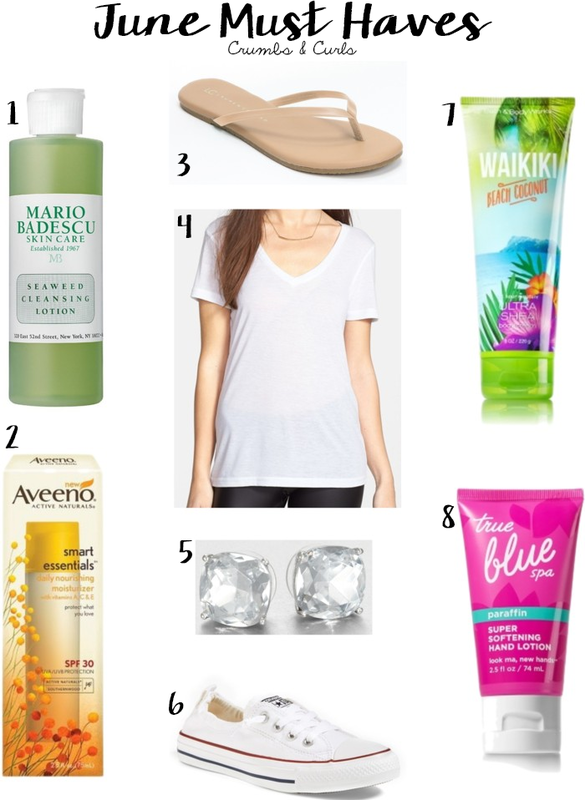 June's must haves are very summer themed as I am all ready for the warm weather! I recently started using this toner and am loving it. It is a non alcohol toner that I use in the morning and at night after I wash my face. It helps to clean your skin, soothe it with seaweed and aloe extract, and it deposits minerals from the seaweed. I've definitely noticed a change in my skin since I started using this. I've talked about this lotion quite a few times, but it is a tried and true favorite of mine. It contains SPF 30, which makes it perfect for the summertime. It's filled with antioxidants in the form of Vitamins A, C, and E that work to fight free radicals that your skin comes into contact with. I put it on every morning after I wash my face and use toner, and it gives me a glow. A great bonus is that the lotion smells amazing! I have been looking for a nice simple flip flop for a while now and I picked these up in black and tan recently at Kohl's. They are perfect to wear all summer long with everything from jeans to shorts to dresses. There are so many colors to choose from and they are currently on sale! A basic t-shirt is a must have for all year round, but I usually find myself wearing them even more in the summer. In my opinion BP. makes the best classic t-shirts, they're soft, cozy, and fit nicely. They come in several colors (although the black and white are my favorite) and are good price at 2 for $28. I have these earrings in black, navy, clear, and hot pink so needless to say I love them. To me they are a classic and so easy to wear. You will probably find me wearing a pair of these most days this summer. I have talked about these quite a lot recently so it's no surprise that they're one of my must haves. I recently got these and have been wearing them nonstop. They go with everything, are so easy to just throw on, and look chic. I picked this up a few weeks ago and my Mom and I are completely obsessed with it. It literally smells like a Piña Colada and the scent lasts on you for quite some time. It is also super moisturizing so it leaves your skin smooth and flake free. This is my absolute favorite hand cream! I put a big dollop of this on every night before I go to bed and it keeps my hands moisturized and smooth. It contains paraffin, olive, avocado, and apricot oils, and it works even better if you slip on a pair of cotton gloves after you put it on. It also have a citrus scent, which smells so good. What are your must haves of the moment? Today I'm linking up with Casual Friday, Fab Favorites, That Friday, Oh Hey Friday, Friday Favorites, Friday Favorites, and The Pick. I am obsessed with my converse. They are so versatile and I wear them all the time! Thanks for stopping by my blog, hope you come again, and follow along! I got that Waikiki Coconut stuff in the regular lotion and body spray as a bridesmaid gift. Smells so good! I love the Kate Spade studs, I have two of the glitter pairs. I want to get the clear stud necklace for all of my bridesmaids, I think! Great picks! I still have those Converse on my wishlist... Thanks for stopping by SLS, have a wonderful weekend. Those earrings are so cute, and that hand cream looks like something I need for sure! Happy weekend! I have white converse and I wear them almost every day throughout the spring and summer. They're so cute and are so nice to throw on with almost any outfit! That tshirt is such a great find at that price!! Great picks! The toner seems really amazing! Thanks for the review! The flip flops look like such a great staple! My current must have is my mango body sorbet from the Body Shop. Such a great moisturiser that isn't sticky like most! Such a fun/strange texture. Great picks! Love Mario!! I have to try that toner!! :) My must have of the moment is a sun hat!! HA!! those converse are so cute! love how they made them more girly! Love these picks! I really need a pair of simple sandals!